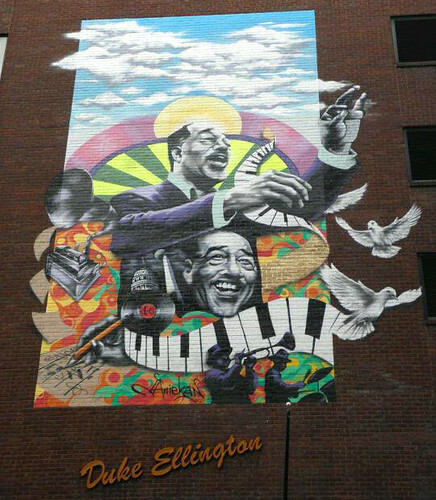 A new Duke Ellington mural has been added to the city’s landscape, joining the other iconic Ellington mural located on U Street, formerly known as “Black Broadway.” The new mural is painted on the side of the Duke Ellington building at 2121 Ward Place NW, near the site where the jazz legend was born. The building now houses a post office, among other services. The mural is painted by local artist Aniekan Udofia (who, full disclosure, is a friend of mine). The full face depiction does not capture the man at all, I’m afraid.